After two years hard work Spring Brezz will be launched this April for the seasons sailing around the north coast of wales. Have you still got Spring Brezz as I have not long bought a Westcoaster from Meols on the Wirral in the same colours as yours. I am working on to get on the water. Have you any plans for the rigging etc. I'm looking forward to seeing some photos of her in the water. From the start I must of bin mad. 21ft Westerly 'Westcoaster' yacht was Denys Rainer's early design. She was built using double plywood for strength and shape and to create a strong seaworthy craft. 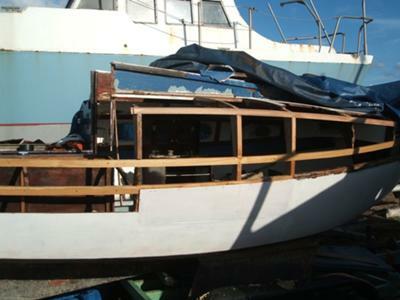 She has no rot and has already had a good deal of renovation done to her. 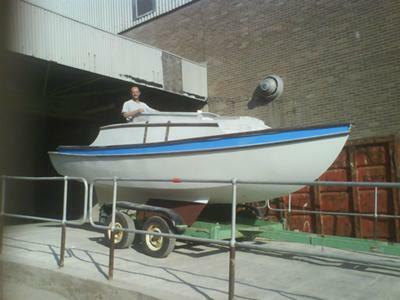 The 'Westcoaster' was featured in the September 1994 edition of Classic Boat magazine. There are not many examples left of this true classic. 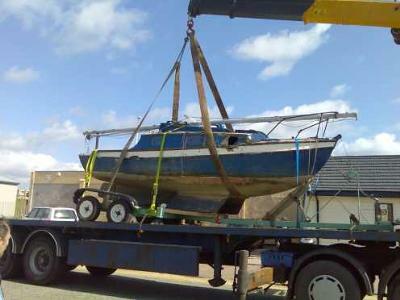 My Father Peter Kauffman owned Halimah in the late 1970’s early 1980’s and kept her at Payne’s boat yard in Chichester. My Father,Lawrie Martin owned Westcoaster Sail No.11 'Halimah' and during the 1970s had great adventures in the Solent with her. She was moored at the top of the Thorney Channel, Chichester twin bilge keels being perfect for sitting out low tide on the mud and for landing on beaches. He undertook many hours of restorations and made several improvements to her rig including the fitting of a bowsprit, turning her into a gunter cutter. Not the fastest or most comfortable craft in heavy weather she was almost impossible to knock-over as her shape and rig would not allow one to press her that hard without her coming off the wind. I remember on more than one occasion, seeing the saloon windows submerged! Lawrie Martin was at the time of his death in 1982, the instigator/chaiman of The Westcoaster Owners' Association. I believe I still have 1970s list of members/boats in the dusty archives. Well I don't think you were in the least mad. Denys Arthur Rayner DSC & Bar, VRD, RNVR was something of a dashing naval hero before turning his hand to designing small boats. The Westcoaster was originally designed as a hard chine bilge keel gunter rigged sloop for a customer sailing in the Bristol Channel, which is my neck of the woods.